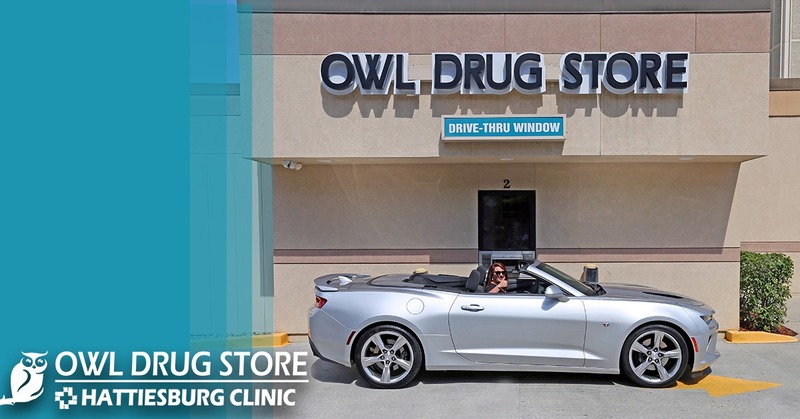 Did You Know Owl Drug Store Offers Drive-Thru Service? You’re so busy today. Between work, school and other activities, you’re just not sure how you could spare the valuable time to find a parking space, walk inside and pick up that prescription you really need. As Hattiesburg’s original hometown pharmacy, Owl Drug Store is committed to friendly, efficient customer service that’s convenient for you and your family. One of Owl Drug Store’s many benefits to its customers is its drive-thru service. Have your prescription ordered or refilled in advance, and then swing through the pharmacy’s easily accessible drive-thru lane at your convenience, located off Medical Boulevard in Hattiesburg. Owl Drug Store is located at #2 Medical Blvd. in Hattiesburg, on the first floor of Hattiesburg Clinic. They are open Monday through Friday, 8 a.m. to 6 p.m., and can be reached at (601) 268-5740. Owl Drug Store was established in 1907 as Hattiesburg’s original hometown pharmacy. It has since found its home as a pillar of Hattiesburg Clinic, where it serves as a convenience to patients of the clinic and the area’s other various medical establishments, as well as surrounding communities. Today, the pharmacy strives to provide friendly and timely service to customers needing prescriptions. They also offer a wide variety of retail merchandise, including seasonal gifts, cards, clothing, jewelry, refreshments and more. Owl Drug Store is served by a team of qualified pharmacists, including Debra V. Akers, RPh; Mike Easterling, RPh; Laura G. Lofton, PharmD, along with a staff of dedicated associates, all of whom are driven to provide a satisfying experience for you and your family. To learn more about Owl Drug Store and the services it offers, visit www.hattiesburgclinic.com/pharmacy.